Just wanted to quickly pay tribute this afternoon to the recent passing of film and television actress Frances Bay. 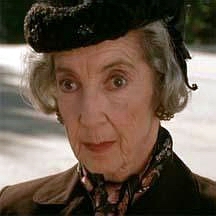 Ms Bay was best known to cinema audiences as the elderly grandmother of Adam Sandler’s character in his ’96 film Happy Gilmore, as well as television episodes of Grey’s Anatomy, The Middle, and Seinfeld, among others. Ms Bay’s first film was a bit-part in the Goldie Hawn thriller Foul Play, and went on to appear in a number of David Lynch films (Blue Velvet and Wild At Heart), as well as an appearance in Clive Barker’s horror flick In The Mouth of Madness. Her television work also included appearances in Happy Days, Charmed and Twin Peaks. Frances Bay passed away on September 15th, aged 92. © 2011, Rodney Twelftree. All rights reserved. Although I didn't recognise the name, I recognised the face. Blimey, she lived to a ripe old age didn't she! Sure did – to be honest, I thought she died ages ago! …and looking at her Imdb page I see she was working right up until her death. That would be into her 90s. Impressive.